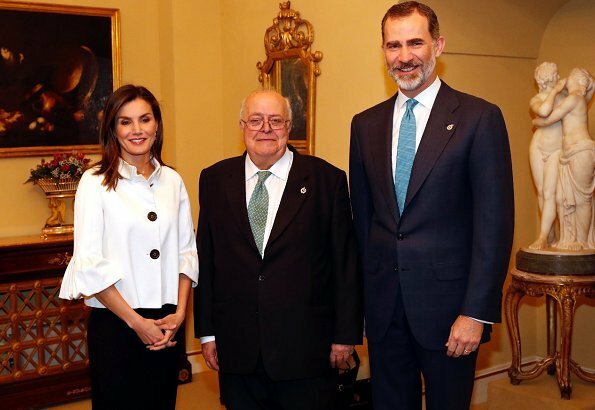 On June 1, 2018, King Felipe VI and Queen Letizia of Spain attended the annual meeting with the members of the Boards of Trustees of the Prince of Asturias Foundation (FPA) held at the El Pardo Royal Palace in Madrid. The institution’s annual report, which contains figures and information related to the activities undertaken throughout the year, presented to the members of the Boards of Trustees during the meeting. I like this jacket. Sleeves are similar to navy dress recently worn by Eugenie. While some may not like this style, I think as long as they are not too big they can look quite pretty, elegant, and feminine. Letizia is such a hard-working queen. Nice black and white combination. But...where was her hairdresser today? Letizias outfit today is nice she can carry it of,the jacket per say is not very flattering for her it looks a little big, I know this is the cut. Black and white always looks good. Agree, it looks fresh and funny and solid. Am I allowed to say something about this outfit or will I be censured again like with the leather pants? You have to stop cencuring comments about you're favorits just because you don't like what we say about their choice. My comment was not even nasty. So if you only want yes voices. Please let us know about who. We know Mary and Leti are two. Who are the others? Not MM, Sofia and Kate obviously since we can trash them as much as we want. So now to this. I like the black and white, but the sleeves are not a hit. As we see on the first photo she don't wear the jacket, the sleeves wear her. So now I guess this will also end up in the trash can. Hi, dear colleague. Personally I don't think there is any reason to get excited about this. Always good however to avoid excessive words or views. This site is doing quite well in this respect. This top and pencil skirt are an understated way of keeping the focus on the event. To our dear colleague, these sleeve are in vogue again this summer..if you visit stores like H&M and Zara you will see. That is why she has rescued it from the back of her closet. Comment are posted at the discretion of the moderator. If your comment was in the current tone..
No, most of us don't trash, nor Kate, MM, or anybody. I firmly believe that comments are deleted, ( not censored) when they are offensive. Fortunately most people on this forum are capable of expressing utter dislike about fashion choices, without trashing as you put it. I also don't believe in conspiracy theories about the author of this blog, nor do I believe that she has favorites, personally I think that she is trying to maintain a civil place, by moderating vulgar comments and personal attacks. I do like this jacket, actually I love it, it's 10 years old, and looks totally current. Surprisingly the hair looks rather crazy today. My comment was not nasty at all. I just said that I felt that leather pants maybe not was the right outfit for a queen and compared the comments when Mary was trashed for her leather top on a boss dress. Not nasty or trashing at all, but still censured. And yes people are nasty as we know about some ladies as I mention above there are no limits to what we can say. We have seen real ugly comments about MM, Sofia, Charlene and Kate. So my question was relevant here. @8:22 Mary wore leather pants to a Women's day celebration last year. On March 23 she also wore navy leggings to a children's event. On both occasions (covered in this forum) her coats were shorter than Letizia's. She is not a queen, but she is auditioning for the job and should be held to the same standard. One of the tricks of good writing is to stick to the subject material as laid out by the author, give an unbiased opinion since we never have all the facts, and not to get excited or ascribe virtues or defects to people we do not know. Your question sounds more like a demand to know why others are allowed to trash these people, but your saccharine comments are deleted. Este es un conjunto encantador, sencillo pero chic. 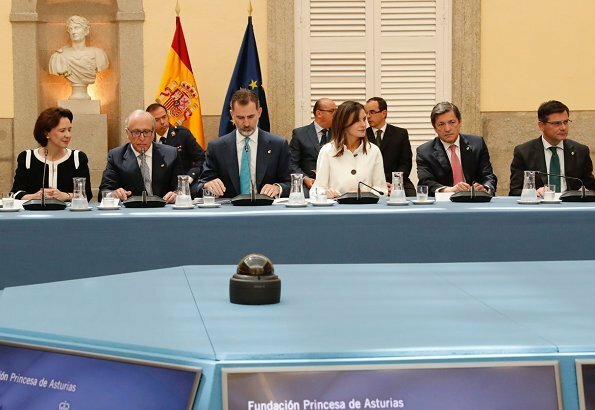 Letizia está muy guapa. Es una lástima que no veamos bien la falda, parece lápiz y de longitud midi, un estilo muy femenino. Those sleeves are "flamenco", she is honoring the country..
Feíta la chaqueta, le queda grande y los botones y volantes son horribles! Eso no es flamenco! Es igual q mi traje de gaditana, las mangas...las andaluzas lo sabemos..
Ese pelo está peinado con cera, a mí me han hecho lo mismo esta mañana para una boda. Anon@ 1:48, totally agree with your fashion comment, when I used the word crazy hair previously, imy intent was by no means offensive...it was more as " oh boy do I have crazy hair today" . Tis is an unflattering jacket. No es flamenco en absoluto. Como que no!! yo bailo flamenco y tengo un vestido con esas mangas, no seras de Andalucía!! Los botones son lo más bonito y contrastan con el blanco.. Anonymous June 2 at 11:02, usted baila flamenco? Pásalo bien! Mi Marido y yo, nosotros bailamos todo, English Waltz y Viennese Waltz, Slowfox, Quickstep y Tango y Rumba, ChaCha, Jive, Samba - y Paso Doble! Paso Doble es un pocito como Flamenco, si? Anonymous @2:14, the fact that you feel the need to correct Coralie on a misspelled word, and to condescendingly explain what the word means, reflects very poorly on you. She is graciously answering another participant, and I don't think she needs any advice from the peanut gallery. The paso-doble in fact was a military march, however it became a popular dance.. Eldest people know how to dance, nevertheless youngest don't know nowadays..
Es una pequeña, lección de español. Si lo lee, seguro que no lo olvidará. Soy muy estricta con la ortografía, no quiero que se difunda erróneamente. Usted mucho bla bla bla pero me insulta todo el tiempo. Hello @Cherty Blossom, very well said, I agree with you a hundred percent. Hopefully by not engaging, they will get tired and stop. Cherry Blossom and Rachel, thank you very much for your support! Of course spanish is not my mother tongue, neither is english. I communicate a lot in english, because I work with an international team, and only few of my teammates are native english speaker. So everybody is generous. English, Spanish....con mayúscula, capital letter....lo leemos todos los dīas! Coralie, you are very welcome. This blog is diverse and very civil, and I have to say that I've never seen people correcting spelling errors or typos of the participants before, with the only purpose of demeaning others behind the anonymity of a key board. I personally appreciate when a person from another country makes the effort to speak to me on my native language, can you imagine if I would correct, and mock them with sarcastic comments? It is called RESPECT. Unfortunately I have seen these individuals destroy other blogs with their vulgarity, speculations, and character assassinations. The result is that the people that only want to enjoy a nice fashion exchange end up leaving, and the site becomes a forum of 7or 8 people outdoing each other with their juvenile comments and political agendas. I would hate to see the same thing happen to this venue. PS, I love the magic of Andalucía, Granada is my favorite city in the whole world. anonymous 1:24..., días lleva tilde o estás escribiendo en griego?? Ves, todos nos equivocamos..
Totalmente de acuerdo con no increpar a los demás..
Wow Cherry Blossom, you are the best!! So nice words you wrote! Wow wow. Coralie, I write in several languages, and I make crass mistakes of the most obvious kind , but I simply don't worry about it! You are a very important and special person in this blog. I send you a warm hug. Ladies, thank you again for your friendly words! Voy a seguir estudiar espanol, aunque sé que voy a hacer errores! AnonymousJune 4, 2018 at 9:45 AM: Prometo que voy a viajar por el norte de Espana también! Anonymous, no creo que Ud. esté capacitado/ capacitada, para dar lecciones de nada y menos aún de español. En primer lugar, no ponga una coma después de la palabra pequeña, pues es un garrafal error gramatical separarla así de la palabra lección a la que califica. En segundo lugar, no de lecciones de nada cuando nadie se lo ha pedido. En tercer lugar, no creo que nadie deba recordar nada de lo que Ud. dice, teniendo en cuenta su intrascendencia. Por favor, tenga el buen gusto de no molestar. Muchas gracias. Coraline, por supuesto, yo soy española y estoy aprendiendo inglés..Si necesitas ayuda aquí me tienes. Un fuerte abrazo. Great style, edgy looks suit her. I miss her shorter hair a little, she looked lovely with an angled bob. Not that her current length is bad. She has the best hairstyles among royal ladies, always so well styled. She looks lovely in black and white - I like the slightly bigger cut of the jacket and the sleeves which give a bit interest. As to her hair, it's fine but she's had much more interesting styles in the past. Would like her to get some sort of cut. King Felipe and Queen Letizia look wonderful. Bravo Coralie. Bravo de verdad...tú no insultas a nadie y tus palabras son elegantes y serenas. No haces juicios de valor.